August 2, 2011 (St. Johns, Antigua) – Intertops Casino is giving away $65,000 to make sure its players have the best summer vacation ever. Each week in August, the popular online casino will award grand prizes up to $500 to players on its Summer Vacation Leaderboard. 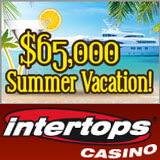 In five weeks of summer giveaways ending as the summer sun sets on Labor Day, Intertops Casino will give away a total of $65,000 in casino bonuses. For the next five weeks, a draw will be held and one player per level will receive a Grand Prize. Every week, winners selected from each of the six levels will receive bonuses of up to $500. Intertops Casino has an incredible selection of casino games to choose from including several million dollar jackpot online slot machines: Jackpot Pinatas, Aztec's Millions and Midlife Crisis/Shopping Spree. There’s also video poker and traditional casino favorites like Blackjack and Roulette. Intertops has been serving players for more than fifteen years and is also known for its quick and friendly customer service and easy deposits and withdrawals.